When I started blogging I did for a few reasons, first it was a creative outlet and it filled a part of my life that was missing. As a stay-at-home mom it was a distraction that took me away from baby stuff that didn’t take me out of the house. My posts were shared only with friends and family. There was no Facebook page, Twitter account, or Pinterest boards to promote my blog. It wasn’t about the numbers. It was for me; a way to experiment with baking and a way to share my experiences. I can’t recall when I made my accounts for all these social media sites (I’m sure they would all tell me if I could be bothered to look), but it changed the way I blogged. All of the sudden it was about trends, shares, and likes. I started making things I thought might do well on the blog instead of things I wanted to actually eat in hopes it would get shared and liked. When I realised I wasn’t enjoying blogging or baking any more following this behavior, I backed off and went back to doing what I liked and relished in any views or likes I did get, not the ones I didn’t get. It’s changed again, but now it seems to be all about the free stuff and/or being paid. There are bloggers out there that have amazing blogs with amazing stats and they deserve to get paid for their work. However, I’m not there yet and I don’t know that I ever will be. There was a time where I was actually quite flattered and said yes to every “free” sample offered to me. 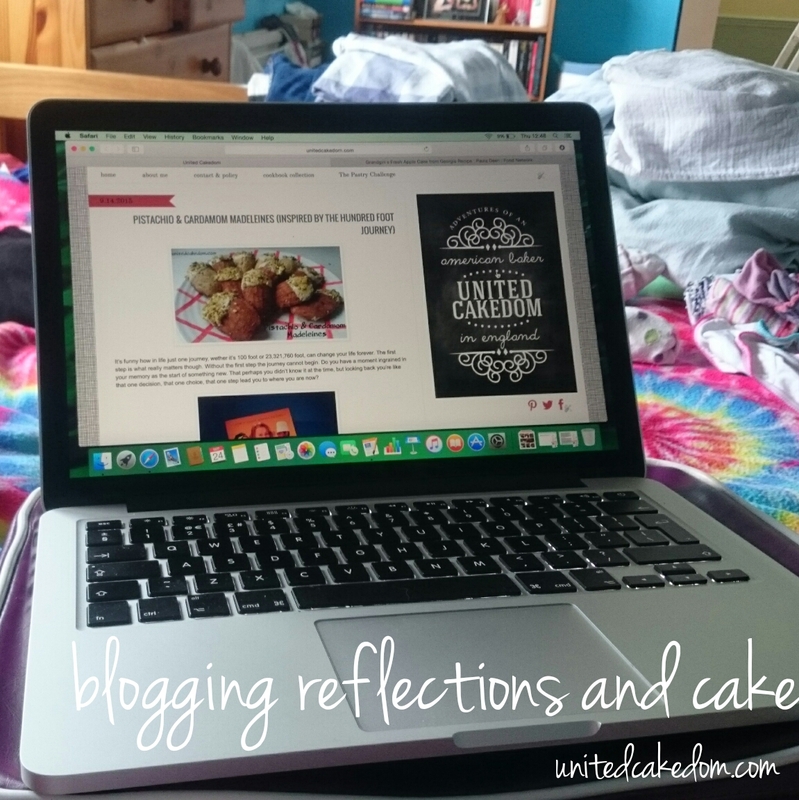 It didn’t long before I didn’t recognise my blog and realised the hard way that nothing is free. I have politely said no to 98% of the opportunities sent my way in the last year or so. Sometimes I wonder if I’m missing out, but I’m not ready, as I mentioned above, to make it a job. It’s something I do besides everything else I do. It’s something I do for me. Blogging 101 - Get to the Point. I do ramble a lot. To the point or to the cake. I taught myself how to bake by using other people’s recipes and then as I became more confident adapting them one way or the other to make them more my own. There are debates on this method of sharing recipes, but I’ve never considered nor claimed myself to be a recipe developer. My blog is to share my adventures in learning to bake and how it’s become a part of my life and changed it. There are still many times I still just follow a recipe and a lot of the time these baked goods don’t make it on to the blog. 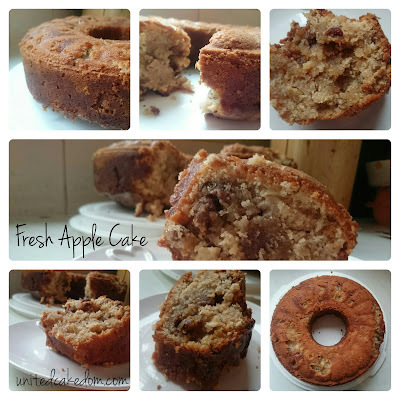 This time I thought I would share it by linking to the recipe online. I found the recipe in a book who had permission to republish it, but it’s also available online. The recipe for Paula Deen’s Fresh Apple Cake from Georgia can be found on the USA Food Network website. First you have the cake with the apples, coconut, and pecans but to take it that step further you pour a warm butter mixture into/onto the warm cake and let it sit to soak in. There are no words. It’s amazing! Follow the link above and make it for yourself. You will want a slice right away as the whole kitchen fills with the smells of autumn spices! notes: or I should say disclaimer! I was not asked to make this recipe or to promote it, Paula Deen, or Food Network in anyway. It looked good and so I made it and I liked it and now I’m sharing with you! Enjoy! It's hard not to get caught up in being a 'blogger', my blog is way to niche to attract much interest at all so I just merrily bob along doing what I enjoy, which is great for me. I see so many bloggers now saying 'I'm not being paid to say this' that it's made me wonder about all the posts I might've read that were... Keep on track and keep enjoying it I'd say! I know I feel like I have to say I'm not getting paid as a disclosure. I don't want readers to assume I am getting paid to something I like or feel strongly about. Thanks for letting me know I'm not the only one plodding along in the blogging world!